Blame it on that twilight period when you're not asleep, but still not entirely awake. That's when the vision of the chocolate and pink "snow" covered trees entered my brain. 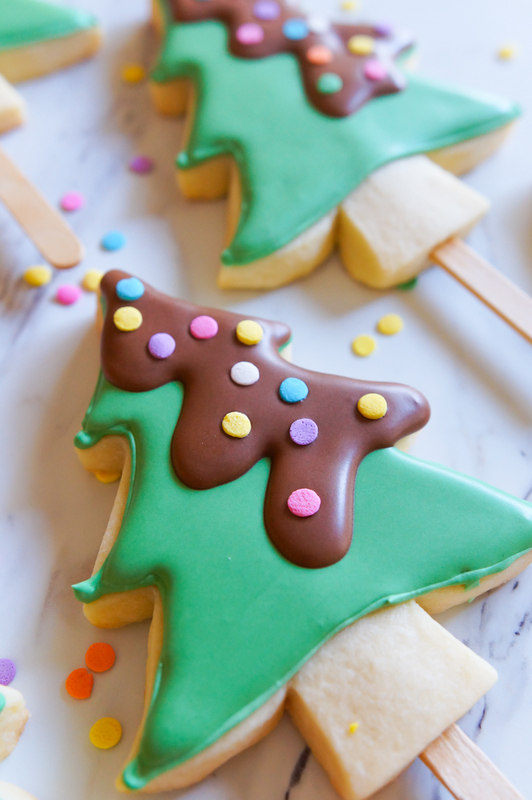 I knew that the idea would either make super cute cookies or be really, really weird. I was willing to take the chance. 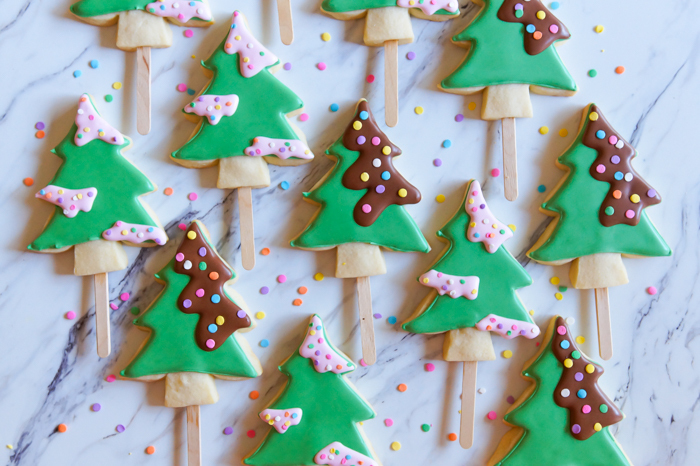 You'll start by making cookies on popsicle sticks. The trick here is to insert the stick AFTER they're baked. I know it sounds wrong, but it works. 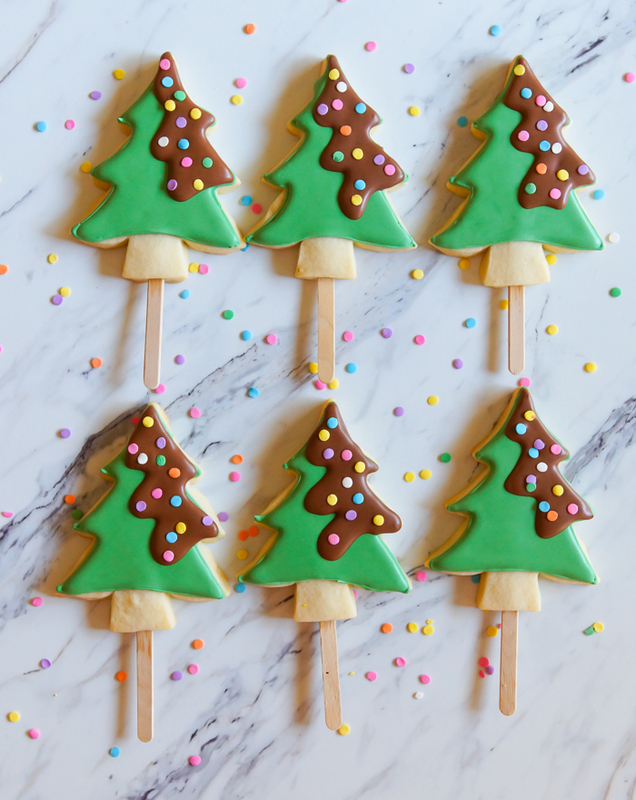 Just like with these ice cream pop cookies, as soon as the cookies come out of the oven, insert the popsicle sticks from the bottom. Leave the cookies on the cookie sheet for about 10 minutes before removing to a cooling rack to cool completely. Why does this work? 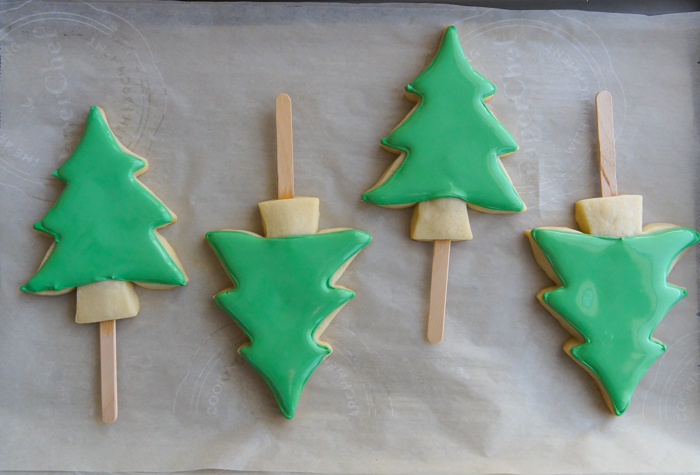 As the cookies cool, the dough adheres to the popsicle stick. On the other hand, if you bake the stick, the dough forms around the stick in the oven, but as the cookie cools, it can loosen. Note: be sure to buy food-grade sticks, not those for crafting which can be treated and have splinters. To my surprise, Mr. E chose the pink. On the other hand, I liked the "chocolate" ones. It's really brown royal icing, but the look of chocolate has me smitten. I mean, look at that!!! Roll the cookie dough to 3/8" inch thick. 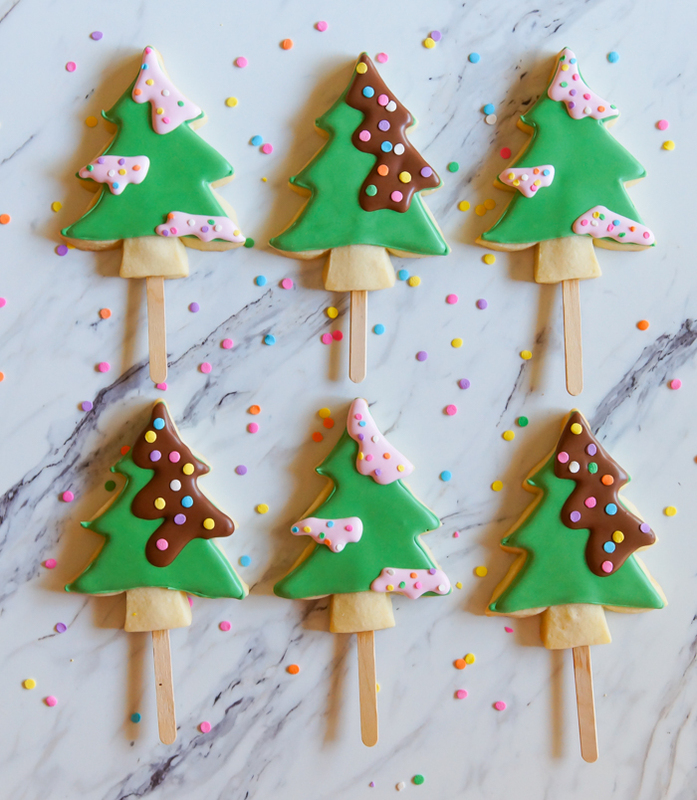 Bake on cookie sheets with enough room to insert a popsicle stick while still on the sheet. 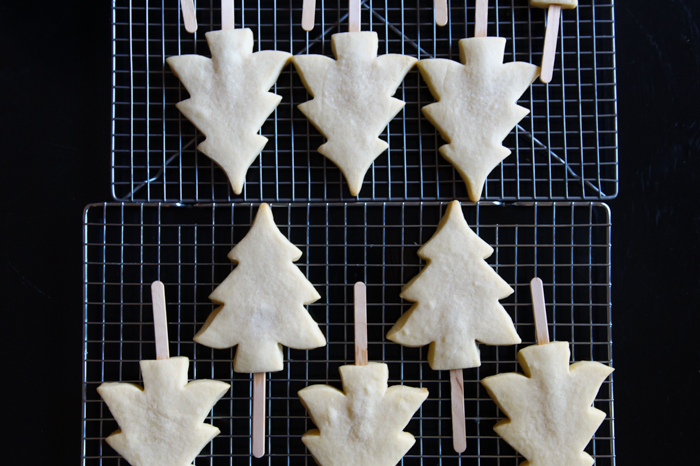 Immediately after removing from the oven, insert the sticks up the middle of the cookies. Let sit on the sheet for 10 minutes, then remove to a wire rack to cool. 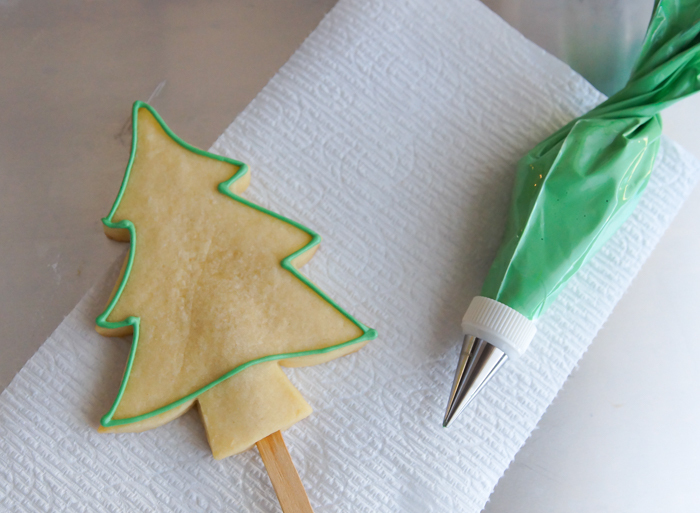 Use a #2 tip to outline the trees in green icing. 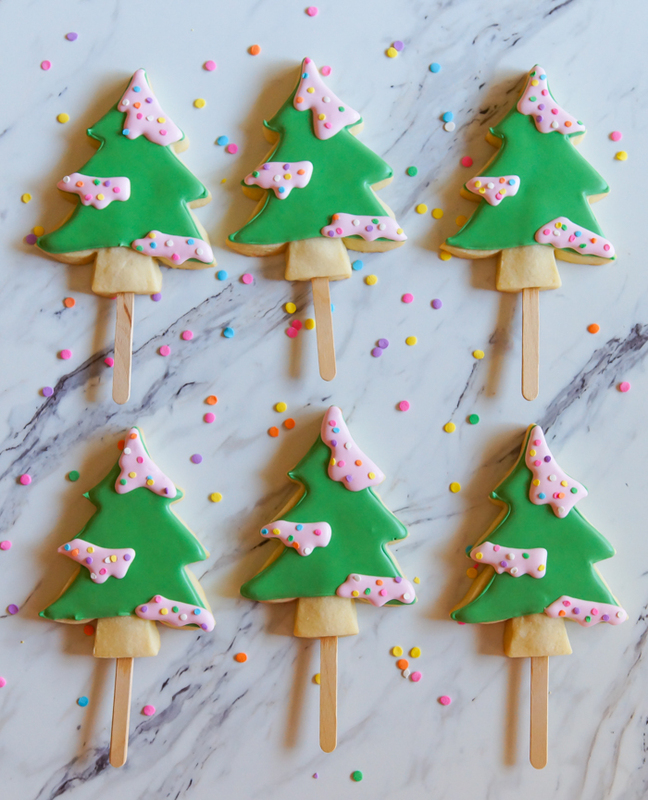 Thin the icing with water, a bit at a time, until a ribbon of icing dropped back on itself disappears in a count of "one thousand one, one thousand two." 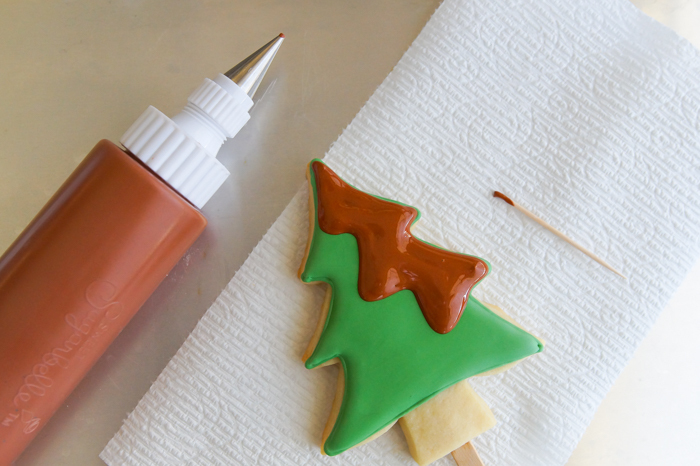 Cover the icing with a damp dish towel and let sit for several minutes. Stir gently to pop large air bubbles and pour into a squeeze bottle. Fill in the outlines. Use a toothpick to guide to edges and pop air bubbles. 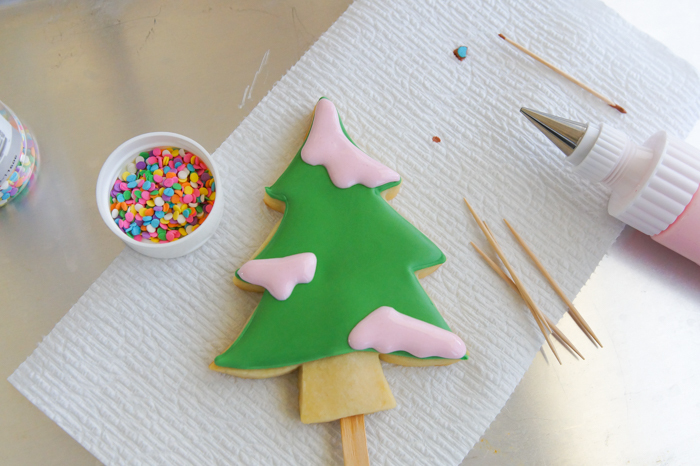 Thin the pink and brown icing as above, but leaving it slightly thicker. Run a knife through the center of the icing. The line should disappear in about 15 seconds. Cover as above and pour into squeeze bottles. 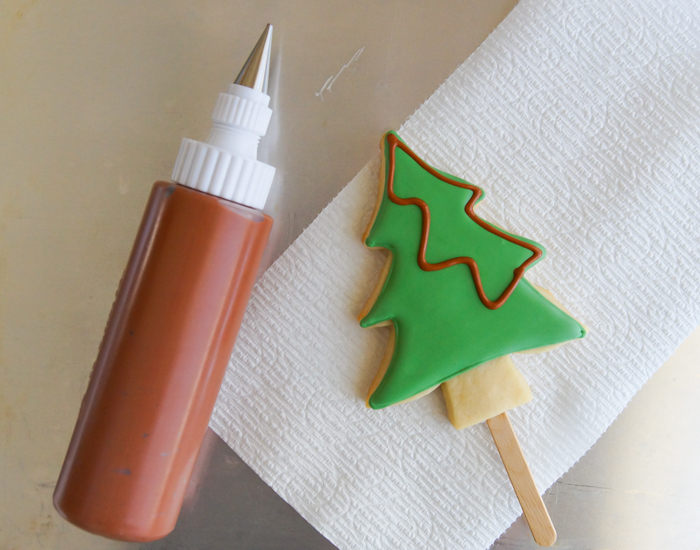 Use this icing to first make an outline, then fill in with the same icing. Use a toothpick to smooth and guide to edges. 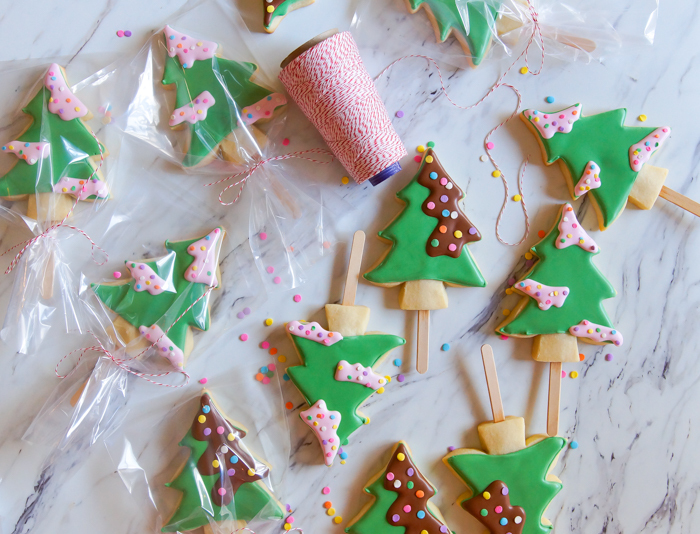 The cookies look especially cute in treat bags and tied with twine. Perfect for giving. 'Tis the season! So cute, I like the pink too. Cute as ever Bridget. 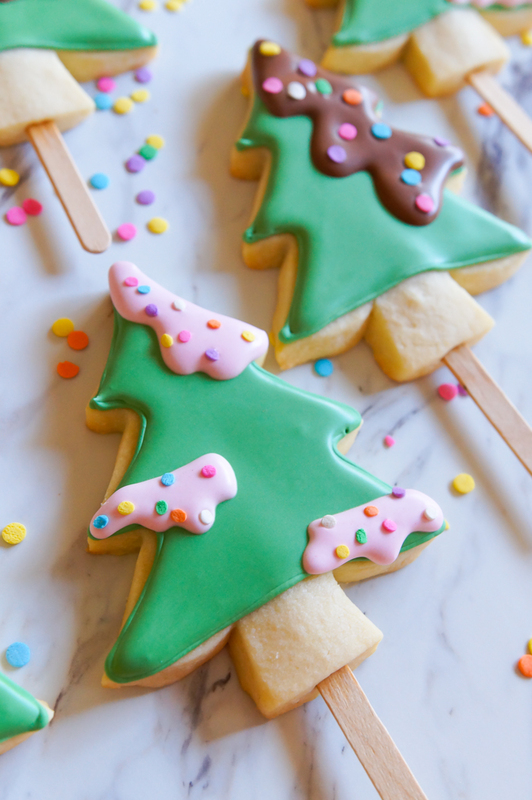 You always make such adorable cookies!! Super cute, with no splinters! I love this idea, Bridget! These are so super cute - and what lovely gifts they make! Thank you for sharing the way. I really enjoy simply reading all of your weblogs. Simply wanted to inform you that you have people like me who appreciate your work check out mine post office change of address. Definitely a great post. Hats off to you.